What’s On The Menu At Amy’s New Organic Fast Food Vegetarian Restaurant? A couple of innovative pioneering entrepreneurs in the fast-food industry, Andy and Rachel Berliner, CEO’s of Amy’s Kitchen, have just made history. Fans of frozen meals from Amy’s Kitchen can now satisfy their cravings for vegetarian, non-GMO, organic food with a spin through Amy’s Drive Thru restaurant in Rohnert Park, (California). The first ready-made food enterprise from Andy and Rachel Berliner, who founded their healthy frozen-food business almost thirty years ago, is now open for business. The building itself is also a paean of eco-friendliness, featuring over 50 solar panels, a living roof and an interior comprised with over 95% repurposed or salvaged wood. I know the vegetarian community is salivating at the possibility of Amy’s Drive-thru franchising and popping up in their own communities. Let’s take a take a virtual drive-thru of Amy’s Drive-thru Restaurant and see what we have to look forward to. 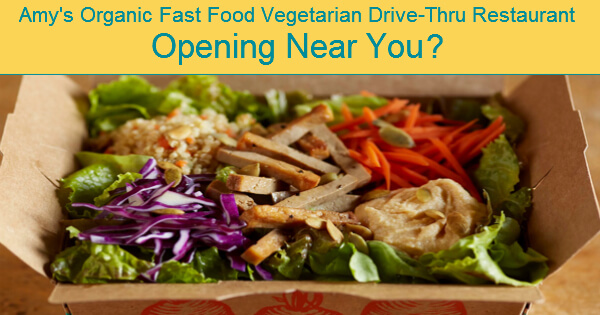 VIEW NFOGRAPHIC: What’s on the menu at the Nations 1st Organic, Vegetarian Fast Food Drive Thru?